Look kids! Joerg sent me to a friend. This is Noritaka Matsubara from Japan. He is going to tell me exactly where we are out on the ocean. 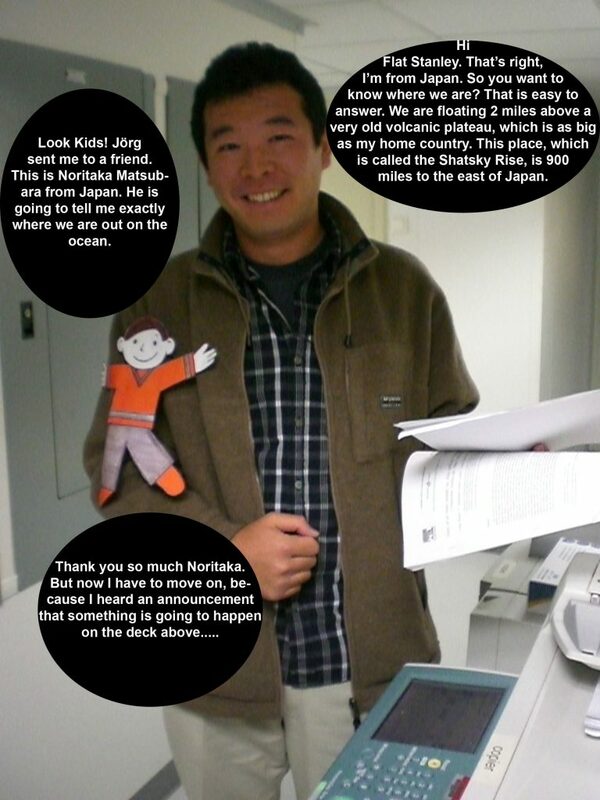 Hi Flat Stanley, That’s right, I’m from Japan. So you want to know where we are? That is easy to answer. We are floating 2 miles above a very old volcanic plateau, which is as big as my home country. This place, which is called the Shatsky Rise is 900 miles to the east of Japan. Thank you so much Noritaka. But now I have to move on, because I heard an announcement that something is going to happen on the deck above…….